I don’t know if the media narrative on the asymmetric Israel-Palestine conflict is in fact changing for the better, though it does seem as if there are more and more reports in the mainstream press depicting Palestinians as people capable of experiencing the full range of human emotion. What seems apparent, though, is that the Palestinian cause is attracting the young of all races while the pasty-white “pro-Israel” crowd ages into irrelevance. 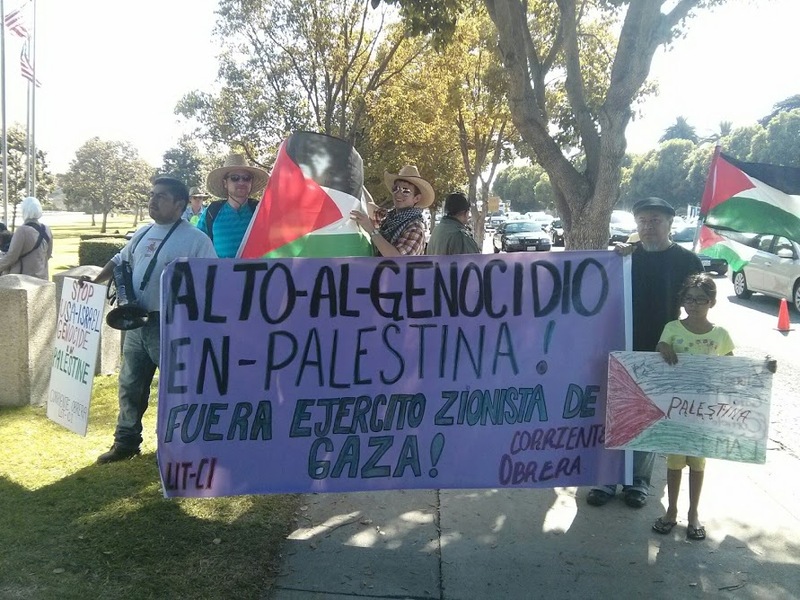 Young people just aren’t as into Israel as their parents, as I saw at a rally for Gaza that was held this past Sunday in Los Angeles. 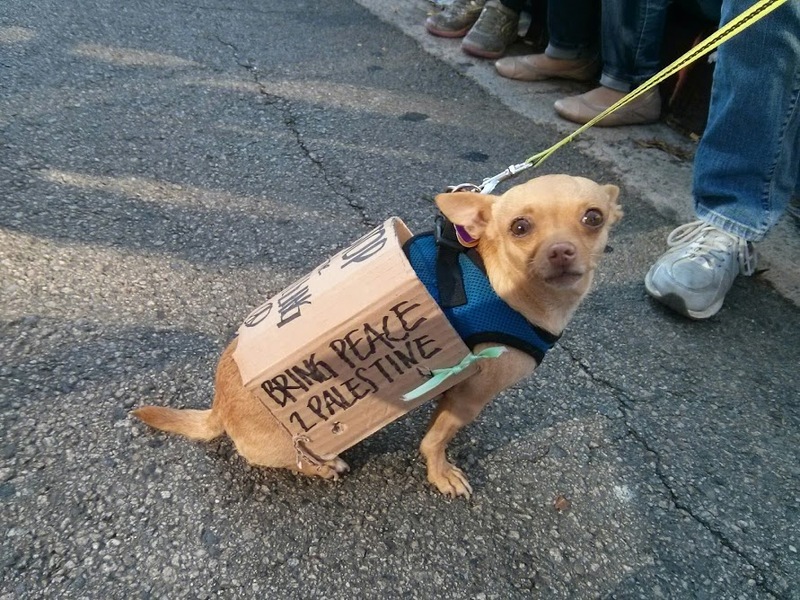 Though the crowd of several hundred people appeared to be predominantly Middle Eastern, there was a significant contingent of whites and Latinos of all ages and at least one adorable dog showing solidarity with the people of Palestine. Protesters holding signs along busy Wilshire Boulevard received enthusiastic honks from what seemed like every other car that drove by; the only negative response I saw was an old woman in a Lexus who extended her middle finger and yelled “terrorist!” at my partner, her role in Islamic terrorism deduced from her wearing a keffiyeh. The only real counter-protesters that I saw walking on their own two feet were a couple of guys holding hand-written, multi-colored signs that projected an image of fringe crackpot-ery, as if they could have seamlessly shifted from defending the slaughter in Gaza to explaining how the Muslim Brotherhood uses chemtrails to promote anti-Semitism. Granted, this was a pro-Palestine protest, but look at the faces of those “standing with Israel” and the story is almost always the same: they’re older, white, and display all the defensive hostility that comes with knowing that support for their cause is slipping away faster than it takes for the IDF to bomb another hospital. Amid the horror of all that’s happening in the world, there’s some comfort in that — though until it results in in meaningful change, it’s of course little comfort to those having bombs dropped on them. See more pictures from the rally here. UPDATE: Statistical evidence backing my anecdotal experience. 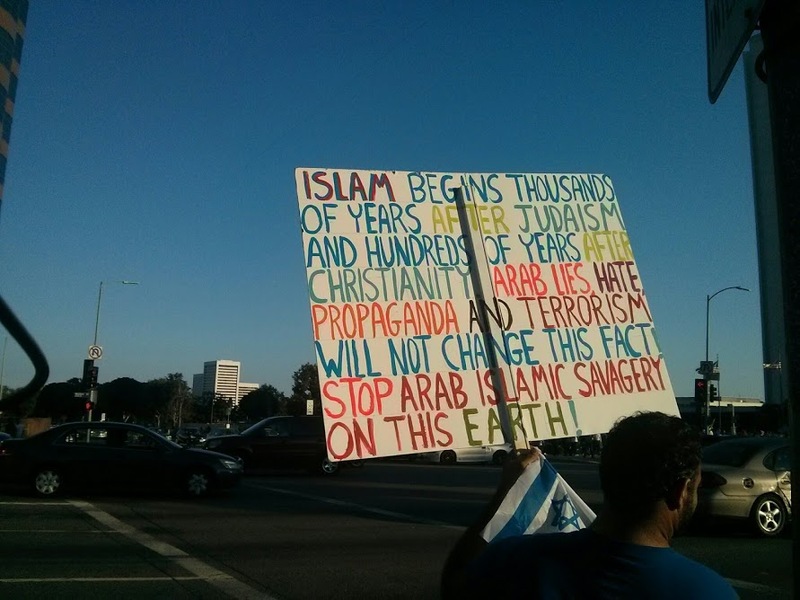 This entry was posted in Islam, Israel/Palestine and tagged Gaza, Israel, Los Angeles, Palestine. Bookmark the permalink.